Finally, you can have your records and eat them too. Thanks to the latest project from UK electronic experimenter Matthew Herbert, your turntable and dinner table can now become one. He's launched a new series in conjunction with the Science Gallery in London that showcases edible sounds. 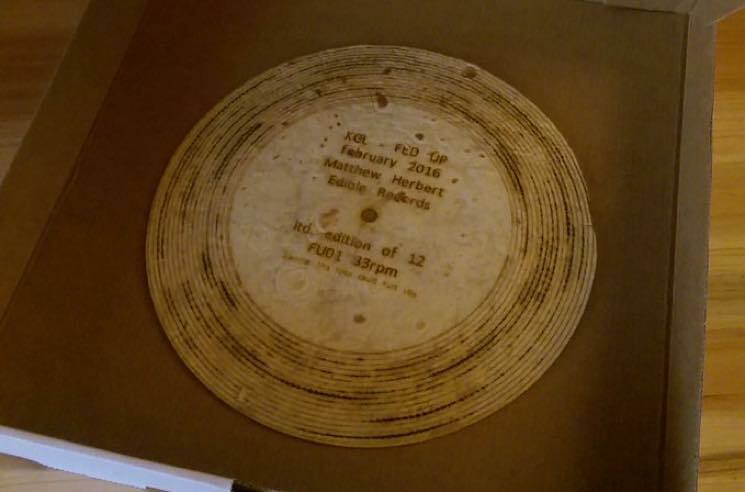 Herbert announced the project via Twitter, sharing a photo of a playable tortilla record. He notes that while the dinner-friendly musical experiment will work "on normal hifi," it's unfortunately "unlikely to be delicious." As printed on the floury disc, the initial release is limited to 12 copies. He's yet to reveal what the burrito base sounds like, but hopefully it's a little bit louder than his last oddball electro experiment — an album that arrived as a book with no music.